The objective of salinity control is to maintain an acceptable crop yield. Several management options are available for salinity control and these will be discussed here as separate options, but in practice a combination may be used to solve the problem. The preceding section discussed the importance of (1) leaching salts out of the root zone before they build up to levels that might affect yields, and (2) maintaining adequate soil-water availability at all times. Adequate drainage is equally important and long-term salinity control is not otherwise possible. If drainage is adequate, the depth of water required for leaching depends on the salt sensitivity of the crop and the salinity of the applied water. When salinity is high, the depth of leaching water needed may be too great, making it necessary to change to a more salt tolerant crop, provided market economics will allow this. In dealing with a major salinity problem related to water quality, a cropping change is considered a drastic step and will only be taken when less severe options have failed to maintain economic production. Leaching, on the other hand, is a basic step in production even for water of the best quality and must be practised when necessary to avoid salt accumulation that could ultimately affect production. Leaching can only be done, however, if the drainage below the crop root zone is sufficient to prevent a rise in the water table so that it is not a source of salt by itself. Drainage, leaching and changes to more salt tolerant crops are used to avoid the impact of long-term salinity build-up but other cultural practices may also be needed to deal with possible short-term or temporary increases in salinity which may be equally detrimental to crop yield. Many cultural practices such as more frequent irrigation, land grading, timing of fertilization and methods of seeding make salinity management easier. If there is a high level of salinity not resulting from water quality, a soil drainage and reclamation programme may be needed and short-term cropping changes may also need to be made. After soil reclamation, the permanent cropping pattern will be determined by water quality. In a few instances, an alternative water supply may be available for periodic use or can be blended with a poorer water supply to diminish a quality-related hazard. These alternatives, including drainage, leaching, cropping changes and cultural practices, will be discussed in more detail in the following sections. Salinity problems encountered in irrigated agriculture are very frequently associated with an uncontrolled water table within one to two metres of the ground surface (Figure 5). In most soils with a shallow water table, water rises into the active root zone by capillarity and, if the water table contains salts, it becomes a continual source of salts to the root zone as water is used by the crop or evaporates at the soil surface. Salinization from this source can be rapid in irrigated areas in hot climates where portions of the land remain fallow for extended periods. The rate of soil salinity accumulation from an uncontrolled shallow water table will depend upon irrigation management, salt concentration and depth of the groundwater, soil type, and climatic conditions. Figure 6 shows that capillary rise from a shallow water table can represent a sizeable salt input into the root zone. In arid and semi-arid climates, a salinity problem caused or complicated by poor drainage cannot be adequately controlled until the water table is stabilized and maintained at a safe depth - usually at least two metres. This requires open or tile drains or drainage wells to remove a part of the salty subsurface water and transport it to an acceptable salt-sink for safe disposal. When drainage is adequate, salinity related directly to water quality and irrigation management becomes a problem only if the salts applied with the irrigation water are allowed to accumulate to a concentration which reduces yield. Effective salinity control, therefore, must include adequate drainage to control and stabilize the water table and leaching as needed to reduced the accumulated salts. A net downward flux of surface applied water to achieve the required leaching will then control the salinity. The guidelines in Table 1 and the remainder of the discussion in this paper assume that all salts accumulating in the crop root zone come from the applied water. This means drainage is adequate and salinity management is a significant part of irrigation management. When the build-up of soluble salts in the soil becomes or is expected to become excessive, the salts can be leached by applying more water than that needed by the crop during the growing season. This extra water moves at least a portion of the salts below the root zone by deep percolation (leaching). Leaching is the key factor in controlling soluble salts brought in by the irrigation water. Over time, salt removal by leaching must equal or exceed the salt additions from the applied water or salts will build up and eventually reach damaging concentrations. The questions that arise are how much water should be used for leaching and when should leachings be applied? To estimate the leaching requirement, both the irrigation water salinity (ECw) and the crop tolerance to soil salinity (ECe) must be known. The water salinity can be obtained from laboratory analysis while the ECe should be estimated from appropriate crop tolerance data given in the tables in Section 2.4.3 of this paper. These tables give an acceptable ECe value for each crop appropriate to the tolerable degree of yield loss (usually 10 percent or less). ECe = average soil salinity tolerated by the crop as measured on a soil saturation extract. Obtain the ECe value for the given crop and the appropriate acceptable yield from Table 4. It is recommended that the ECe value that can be expected to result in at least a 90 percent or greater yield be used in the calculation. (Figure 7 was developed using ECe values for the 100 percent yield potential.) For water in the moderate to high salinity range (>1.5 dS/m), it might be better to use the ECe value for maximum yield potential (100 percent) since salinity control is critical to obtaining good yields. The total annual depth of water that needs to be applied to meet both the crop demand and leaching requirement can be estimated from equation (7). 1 In many texts, the Terms ‘leaching fraction (LF)’ and ‘leaching requirement (LR)’ are used interchangeably. They both refer to that portion of the irrigation which should pass through the root zone to control salts at a specific level. While LF indicates that the value be expressed as a fraction, LR can be expressed either as a fraction or percentage of irrigation water. It takes time to accumulate salts in the root zone to a concentration that reduces yield. Most irrigation water is of such good quality that, without leaching, two or more years of irrigation will be required before salinity accumulates sufficiently to affect yield. Further, the later in the growing season the salts reach damaging concentrations, the less will be their effect. This suggests that if salts are low enough at the start of the irrigation season, efficiency of water use during the growing season can be 100 percent (no leaching) without loss of yield due to salinity. For the next season, rainfall, dormant season and pre-plant irrigations, singly or in combination, can be used to replenish deep soil moisture and leach soils free enough of accumulated salts to allow efficient water use again during the next growing season. It is often difficult to supply both essential crop water and leaching water during the hot summer season. The key factor to remember is that leaching is not needed until accumulating salinity is expected to exceed crop tolerance and reduce yield. The timing of leachings does not appear to be critical provided crop tolerance is not exceeded for extended or critical periods of time. This certainly does not mean that leaching is relatively unimportant. The leaching requirement must be satisfied to prevent excessive salt accumulation. Leaching can be done at each irrigation, each alternate irrigation or less frequently, such as seasonally or at even longer intervals, as necessary to keep salinity below the threshold above which yields may be unacceptably reduced. In many instances, the usual inefficiencies of water application satisfy the leaching requirement and additional leaching is wasteful of water (see Example 3). Where low leaching fractions (<0.10) are needed, as with good quality water, inefficiencies in irrigation water application will almost always apply sufficient extra water to accomplish leaching. In other instances, particularly with higher salinity water, meeting the leaching requirement is difficult and requires large amounts of water, possibly adding to a drainage problem. It can be assumed that an appreciable portion of the total deep percolation losses from normal irrigation practices is useful in controlling salinity. A maize crop is irrigated by furrow irrigation. The crop is planted in a uniform loam soil and river water, which has an ECw = 1.2 dS/m, is used for irrigation. The crop evapotranspiration (ET) is 800 mm/season. The irrigation application efficiency is 0.65. Therefore the total amount of water that must be applied to meet crop ET demand is 800 mm/0.65 = 1230 mm/season. How much additional water must be applied for leaching? Explanation: The leaching requirement can be calculated using equation (9) and substituting the appropriate ECe value for the desired yield potential (from Table 4). The actual amount of water to be applied to supply both crop ET and leaching (long-term salt control) can be found by using equation (7). Since a 1230 mm depth of applied water is needed to ensure that the maize crop is adequately irrigated to meet the 800 mm ET demand and, since this 1230 mm is in excess of the calculated depth of 890 mm required to meet both crop ET demand and the leaching requirement, the question arises whether the losses in excess of ET are deep percolation losses and whether these losses may be satisfying the leaching requirement. Water losses due to deep percolation are often greatly in excess of the leaching fraction of 0.15 assumed in the crop tolerance tables (Table 4) as being typical of efficient irrigated agriculture. If, in this example, the losses are due to deep percolation, no additional leaching to control salinity is necessary since the required leaching fraction of 0.10 or 0.16, as calculated above, will be satisfied by irrigation inefficiency (losses) during water application. Rainfall must be considered in estimating the leaching requirement. Rainfall that enters the soil is effective in meeting both crop ET and the leaching requirement. Rainfall that infiltrates into the soil (effective rainfall) replaces ET losses. If in excess of ET, it becomes drainage water and will satisfy part or all of the leaching needed to control salts. The advantage of rainfall in accomplishing all or part of the leaching is that it uniformly applies an almost salt-free water (ECw < 0.05 dS/m). Leaching is further enhanced if the rate of rainfall is below the infiltration rate of the soil. If the total amount of rainfall infiltrated is sufficient, it will reduce the average salinity used for the applied water (ECw) in calculating the leaching requirement (LR) and thus reduce proportionately the required leaching. Figure 8 shows how rainfall quickly reduces the salinity in the crop root zone. In low rainfall years or low rainfall areas, precipitation may not be adequate to refill the soil to its water holding capacity, in which case no leaching occurs to reduce accumulated salinity other than to move the salts from the upper part of the root zone deeper into the soil. The upper portions of the rooting depth will then reflect the very low salinity levels of the rainfall which can enhance germination. In areas where rainfall occurs in the cooler months or winter season, it may be possible to enhance winter leaching even in a dry year. It is recommended that a heavy autumn or early winter irrigation be given to refill the soil profile with water before the rains. Winter rains will then complete the soil-water replenishment and accomplish all or part of the required leaching with low-salt water. If the rewetting or leaching is still not complete by crop planting time, the deep percolation losses from extended early season irrigations may accomplish the soil rewetting and salt leaching. Figure 9 shows how winter rains have leached salts from citrus plantings in Cyprus. The leaching requirement can be calculated (Equation 9) but we can only make estimates of the amount of leaching that is actually taking place. Soil and crop monitoring are useful tools to determine the need for leaching. Considerable variation occurs from one cropping season to the next; therefore, monitoring should stress long-term trends and changes in soil salinity. use an irrigation before the start of the rainy season if total rainfall is normally expected to be insufficient to do a complete leaching. Rainfall is often the most efficient leaching method because it provides high quality water at relatively low rates of application. A good irrigation management plan strives to apply sufficient water to meet the crop water demand plus the leaching requirement without wastage. Both the crop water demand and leaching requirement can be estimated and the depth of applied water needed can be calculated. In many instances, however, estimates of depth of applied water (flow rate, duration and area covered) are inaccurate or not available, making estimates of effectiveness of leaching for salinity control unreliable. Existing conditions and reliable estimates of past management can be determined with a reasonable degree of certainty by means of soil samples, analysed for salinity. From the soil samples an apparent leaching fraction as well as an average root zone salinity resulting from past irrigation practices can be determined. Estimate the probable depth of rooting of the last crop grown-from observation (pit, hole, soil samples, etc. ), or from past experience. Depth estimate should include 75 to 85 percent of the observed root zone. Take representative soil samples from each quarter depth of root zone and analyse each quarter depth separately for ECe by the soil paste extraction method of the US Salinity Laboratory (USDA 1954). Plot by a graph similar to that of Figure 2 for the soil depth and salinity representative of each quarter depth of root zone and compare this curve with the curves depicting the various typical leaching fractions (LF = 0.1, 0.15, 0.2, 0.3, 0.4) in the graph. Then, estimate a leaching fraction for the site sampled based on the shape of the salinity profile. From the ECe of the four soil samples (one from each quarter depth of the root zone) calculate the average root zone salinity and compare with the crop tolerance ECe values in Table 4 for the crops to be planted. From the apparent leaching fraction and the average ECe of the root zone, make any necessary management decisions to adjust irrigations to increase or decrease the leaching fraction in order to stay close to the tolerance of the preferred crop. Alternatively, change the crop to agree more closely with the existing salinity conditions. All plants do not respond to salinity in a similar manner; some crops can produce acceptable yields at much greater soil salinity than others. This is because some are better able to make the needed osmotic adjustments enabling them to extract more water from a saline soil. The ability of the crop to adjust to salinity is extremely useful. In areas where a build-up of soil salinity cannot be controlled at an acceptable concentration for the crop being grown, an alternative crop can be selected that is both more tolerant of the expected soil salinity and can produce economical yields. There is an 8 to 10-fold range in salt tolerance of agricultural crops. This wide range in tolerance allows for a much greater use of moderately saline water much of which was previously thought to be unusable. It also greatly expands the acceptable range of water salinity (ECw) considered suitable for irrigation. The relative salt tolerance of most agricultural crops is known well enough to give general salt tolerance guidelines. Tolerances for many common field, vegetable, forage and tree crops are given in Table 4. This table has been updated from the 1976 edition and gives the latest tolerance values for crops grown under semi-arid irrigated agriculture. Where insufficient data exist to give numerical values for tolerance, a relative rating has been assigned to the crop, based on field experience, limited data or observations. For comparative purposes, relative tolerance ratings are listed in Table 5 for a large number of crops, including many of those given in Table 4. General groupings for tolerance are shown in the schematic diagram in Figure 10. The relative tolerance ratings, even if based on a limited amount of data, are useful for comparisons among crops. The relative crop tolerance ratings were considered in setting the degrees of ‘restriction on use’ in the guidelines of Table 1. For example, the tolerance data of Table 4 indicate that a full yield potential should be obtainable for nearly all crops when using a water which has a salinity less than 0.7 dS/m. The guidelines of Table 1 indicate that water of this salinity would have no restriction on use. For the salinity listed in the slight to moderate range, a full yield potential is still possible but care must be taken to achieve the required leaching fraction in order to maintain soil salinity within the tolerance of the crop. For higher salinity water and sensitive crops, increasing the leaching to satisfy a leaching requirement greater than 0.25–0.30 may not be practical because of the excessive amount of water required. In such a case, consideration must be given to changing to a more tolerant crop that will require less leaching to control salts within crop tolerance. As the water salinity (ECw) increases within the slight to moderate range, production of the more sensitive crops may be restricted due to an inability to achieve the high leaching fraction needed, especially when grown on the heavier, more clayey soil types. If the salinity of the applied water exceeds 3.0 dS/m, as shown in Table 1 for a severe restriction on use, the water may still be usable but its use may need to be restricted to more permeable soils and more salt tolerant crops where the high leaching fractions are more easily achieved. The salt tolerance data of Table 4 are used in the calculation of the leaching requirement. Figure 7 can also be used to estimate the leaching requirement if crop tolerance grouping and water salinity are known, as discussed in the previous section. If the exact cropping patterns or rotations are not known for a new area, the leaching requirement must be based on the least tolerant of the crops adapted to the area. In those instances where soil salinity cannot be maintained within acceptable limits of preferred sensitive crops, changing to more tolerant crops will raise the area's production potential. In case of doubt as to the effect of the water salinity on crop production, a pilot study should be undertaken to demonstrate the feasibility for irrigation and the outlook for economic success. 1 Adapted from Maas and Hoffman (1977) and Maas (1984). These data should only serve as a guide to relative tolerances among crops. Absolute tolerances vary depending upon climate, soil conditions and cultural practices. In gypsiferous soils, plants will tolerate about 2 dS/m higher soil salinity (ECe) than indicated but the water salinity (ECw) will remain the same as shown in this table. 2 ECe means average root zone salinity as measured by electrical conductivity of the saturation extract of the soil, reported in deciSiemens per metre (dS/m) at 25°C. ECw means electrical conductivity of the irrigation water in deciSiemens per metre (dS/m). The relationship between soil salinity and water salinity (ECe = 1.5 ECw) assumes a 15–20 percent leaching fraction and a 40-30-20-10 percent water use pattern for the upper to lower quarters of the root zone. These assumptions were used in developing the guidelines in Table 1. 3 The zero yield potential or maximum ECe indicates the theoretical soil salinity (ECe) atwhich crop growth ceases. 4 Barley and wheat are less tolerant during germination and seeding stage; ECe should not exceed 4–5 dS/m in the upper soil during this period. 5 Beets are more sensitive during germination; ECe should not exceed 3 dS/m in the seeding area for garden beets and sugar beets. 6 Semi-dwarf, short cultivars may be less tolerant. 7 Tolerance given is an average of several varieties; Suwannee and Coastal Bermuda grass are about 20 percent more tolerant, while Common and Greenfield Bermuda grass are about 20percent less tolerant. 8 Broadleaf Birdsfoot Trefoil seems less tolerant than Narrowleaf Birdsfoot Trefoil. 9 Tolerance given is an average for Boer, Wilman, Sand and Weeping Lovegrass; Lehman Lovegrass seems about 50 percent more tolerant. 10 These data are applicable when rootstocks are used that do not accumulate Na+ and Cl- rapidly or when these ions do not predominate in the soil. If either ions do, refer to the toxicity discussion in Section 4. 11 Tolerance evaluation is based on tree growth and not on yield. 2 These data serve only as a guide to the relative tolerance among crops. Absolute tolerances vary with climate, soil conditions and cultural practices. 3 The relative tolerance ratings are defined by the boundaries in Figure 10. Detailed tolerances can be found in Table 4 and Maas (1984). Numerical values for tolerance given in Table 4 were adapted from data of Maas and Hoffman (1977) and Maas (1984). These data indicate that plant growth rate decreases linearly as salinity increases above a critical threshold salinity at which growth rate first begins to decrease. This linear decrease in yield is in good agreement with field data throughout the usual range of salinity. Deviations from the linear decrease occur at yields considerably less than 50 percent of potential, at which level yields are commercially unacceptable anyway. The following equation (Maas and Hoffman 1977) expresses the straight line salinity effect on yield and was used in the preparation of Table 4.
where ECe is the soil salinity associated with a designated percent yield, Y (see Example 4). In Table 4 values are presented for the potential yields of 100, 90, 75, 50 and 0 percent. Table 4 also lists the applied irrigation water salinity (ECw) equivalent to the soil salinity (ECe) developed by the use of equation (5). This concentration factor from water salinity (ECw) to soil salinity of 1.5 is representative of a 15–20 percent leaching fraction. It was used in the development of the guidelines, and concentration factors for other leaching fractions are given in Table 3. The tolerance limits of Table 4 for water salinity assume that the soil salinity (ECe) results from accumulatin of salts coming from the applied irrigation water. If there is a source of salt other than the irrigation water, for example from a high water table, the concentration relationship between water salinity (ECw) and soil salinity (ECe) is not valid, but the ECe values given in Table 4 are still valid. It is again emphasized that the soil salinity (ECe) that is expected to develop following several years of use of a water assumes that the water is the primary source of soluble salts. If a water table is present, it is an additional salt source not considered in the fixed relationship ECe = 1.5 ECw. If conditions of use consistently indicate a leaching fraction other than 0.15 to 0.20, the concentration factor (1.5 ECw = ECe), will also be different and the equivalent water salinity (ECw) of Table 4 can be changed and a new table prepared. However, this should only be done if well documented local experience confirms that the 1.5 concentration factor does not apply. The soil salinity values (ECe) presented in Table 4 for crop tolerance are believed to be the best available to date and should not be changed. They are supported by extensive and worldwide field research. Changing the leaching fraction to change the concentration factor is one of the options available for control of salinity. Table 3 presents concentration factors for various leaching fractions. These are useful to predict soil salinity (ECe) that is expected to result from use of water at any given salinity and leaching fraction, as explained in a previous section. The majority of the yield data used by Maas and Hoffman (1977) to develop their linear equation (Equation 10) were for yields varying between 50 and 100 percent yield potential. Because the linear equation predicts these yields so well, it can be used to predict the approximate theoretical soil salinity (ECe) at which the plant is presumed to be unable to extract water, and growth ceases (yield in this case would be zero). The maximum ECe or the 0 percent yield predicted by this procedure are given in the last column of Table 4. Figure 11 illustrates this projection to the expected salinity for zero yield. If there are few crops in an area, it may be desirable to prepare separate guidelines for each specific crop or group of crops rather than use the broad guidelines given in Table 1. Guidelines for an individual crop can be more specific and are better aids to managers and cultivators for evaluating the suitability of the available water supply. An example of such a specific guideline is given in Table 6. Crop production potential using a particular irrigation water can range from 100 percent down to zero but there are often factors other than water quality which affect yield. The tolerance values in Table 4 represent production potential when salinity is the only limiting factor. Such conditions, however, do not always exist. Other conditions may also limit production but the relative yield loss due to salinity will approximate those in Table 4 if salinity is the main limiting factor. The soil salinity tolerances in Table 4 apply primarily to crops from late seedling stage to maturity. Tolerance during the germination and early seedling stage may be different and is only clearly defined for a few crops. Table 7 presents data for a few crops showing soil salinity that resulted in a 50 percent reduction in either yield or seedling emergence. In general, if the soil salinity in the surface soil (seeding area) is greater than 4 ds/m, it may inhibit or delay germination and early seedling growth. This slowed germination may then delay emergence, allowing soil crusting and disease problems to reduce the crop stand. Rainfall or pre-plant irrigations will often help to maintain low salinity, delay crusting and promote good emergence. 2 Special management practices and favourable soil conditions are required for successful production. 3 Assumes that rainfall and extra water applied owing to inefficiencies of normal irrigation will supply the crop needs plus about 15 percent extra for salinity control. 4 With overhead sprinkler irrigation, sodium or chloride in excess of 3 me/l under extreme drying conditions may result in excessive leaf absorption, leaf burn and crop damage. If overhead sprinklers are used for cooling by frequent on-off cycling,damage may occur even at lower concentrations. 5 Bicarbonate (HCO3) in water applied by overhead sprinklers may cause white deposits on fruit and leaves which reduces market acceptability, but is not toxic to the plant. Rootstocks used for certain tree (citrus, almonds, stone-fruit) and vine crops (grapes) can appreciably influence salinity tolerance. Rootstocks differ in their ability to exclude salt, especially the toxic sodium and chloride ions. With a reduction in the amount absorbed, accumulation is reduced. This characteristic for exclusion has allowed selection of commercially acceptable rootstocks as well as varieties for improved production under saline conditions of soil or water. Varietal differences also exist among cultivars of annual crops. The greatest differences in tolerance appear to be among selections from cultivars of the more salt tolerant crops. A few may be significantly more or less tolerant than indicated in Table 4. A careful screening of available varieties is essential if salinity of applied water makes tolerance critical. Plant breeding and selection for salinity tolerance have only recently been undertaken to any appreciable extent. Initial results are promising and have stimulated new research in genetic salt tolerance, particularly among closely related varieties or strains within a variety. If successful, plant breeding and gene selection for salinity tolerance may greatly expand our ability to use more saline water suplies, but any new information on tolerance should be used with caution. Any new varieties developed, and having greater tolerance, should be judged on their own merits. A number of years (5–15 or more) will probably be needed before even a few new, more salt tolerant crops are commercially available and competitive in yield and quality with present varieties. The tolerances given in Table 4 are expected to remain valid for most of the crops for the foreseeable future. Climate also affects crop tolerance to salinity and drought. In general, crops grown in cooler climates or during the cooler time of the year will have a higher tolerance to salinity then similar crops grown during warmer, drier periods. Since crop demand for water is less during the cooler periods, the effect of reduced water availability due to salinity is not so critical and a greater proportion of rainfall or applied water may be available to leach accumulated salts. In contrast, however, during periods of very high ET demand, as in summer months, under hot, dry conditions, water absorption by the plant roots may not be adequate due to both rapid depletion of soil water and increased salt concentration around the roots. Under these conditions, the plants may show earlier water stress than anticipated from normal bulk soil sampling and water stress may be critical during extended periods of hot dry winds. Climate appears to affect salt sensitive crops to a much greater extent than salt tolerant ones. Fertilization has little effect on salt tolerance. If fertility is a limiting factor, proper fertilization will increase yields, but if fertilization is not limiting, additional fertilizer will not improve salt tolerance. Since fertilizers are for the most part soluble salts, timing and placement are important, and unless properly applied they may contribute to or cause a salinity problem. The primary management options to control salinity were discussed in the preceding sections: adequate drainage, leaching to control salinity within the tolerance of the crop or, if this cannot be done, change to a more salt tolerant crop that requires less leaching for adequate salt control. These management practices are the ones most appropriate for long-term salinity control but there are separate cultural practices that can have a profound effect upon germination, early seedling growth and ultimately on yield of crop. Low yields are often the result of obtaining poor crop stands during the germination or early seedling stage of growth. These short-term cultural practices that aid in salinity control become more important as the irrigation water salinity increases, and are often done on an annual or continual basis. They include land smoothing for better water distribution, timing of irrigations to prevent crusting and water stress, placement of seed to avoid areas likely to be salinized, and care in selection of materials, rate and placement of fertilizers. Salinity control is difficult if a field is not sufficiently graded to permit uniform water distribution. Salts accumulate in the high spots which have too little penetration and leaching (water runs off), while water accumulates in low-lying areas which causes waterlogging and potential drainage problems. Germination is often poor in high spots due to shortage of water and excessive salinity, while in low areas, similar poor crop stands may result from waterlogging and soil crusting. The most difficult problems occur with flood (border check or strip check) irrigation whereas sprinkler or localized (drip) irrigation require smoothing or grading only to the extent needed to prevent water from accumulating excessively in low areas. Land smoothing (land planing) simply smooths the soil surface. Although a good practice, it does not grade a field and is not a substitute for land levelling to a set gradient or slope. Land smoothing is often an annual practice or is done every few years to ensure uniform water distribution when annual crops are changed. In contrast, land grading is usually a one-time practice where ‘cuts’ from one part of a field are transported to another area of the same field and spread as ‘fill’ to raise the level in that area. After this one-time field grading is done, land smoothing or a less extensive land grading is done to restore the field slope or gradient which may have changed slightly due to cropping, cultivations and irrigations. Recent deep alluvial soils can be smoothed or graded with little risk of greatly damaging soil quality but the older, mature and layered alluvial or residual soils may be difficult to smooth, level or grade to a set slope without serious structural damage. Land grading causes a significant amount of soil compaction due to the weight of the heavy equipment and it is advisable to follow this operation with subsoiling, chiselling, or ploughing to break up the compaction and restore or improve water infiltration. The timing of irrigations to prevent water stress will improve the chances for success when using higher salinity water. Irrigation timing may include increasing the frequency of irrigation, irrigating prior to a winter rainy season, and using pre-plant or other practices to aid in germinating the crop. The goal of irrigation timing is to reduce salinity and avoid water stress between irrigations. Water stress between irrigations can often be eliminated by increasing the frequency of irrigations, thereby preventing excessive root zone depletion caused by too long an interval between irrigations. By decreasing the interval between irrigations, a higher soil-water availability is maintained. Increasing the frequency of irrigations may not always produce the desired results. For example, with furrow and other flood methods, a change to more frequent irrigation may result in an unacceptable increase in depth of water applied, a corresponding decrease in water use efficiency and consequent drainage problems. These irrigation methods are generally less efficient because the depth of water applied per irrigation cannot be as easily adjusted as with sprinkler or drip. With the more efficient methods of irrigation, increased frequency may not greatly increase water use. More frequent irrigations may not be practical except in areas where water can be taken on demand. A good knowledge of crop water demand as the season advances is necessary to determine proper frequency. The methods for estimating crop water demand (ET) and the periods of greatest sensitivity are discussed in Doneen (1971); Doorenbos and Pruitt (1977) and Doorenbos and Kassam (1979). Salts from higher salinity irrigation water can accumulate rapidly in the top few centimetres of the soil due to surface evaporation during non-crop periods, particularly if a high water table is also present and the climate is hot and dry. The extent of accumulation is influenced by salinity of both the irrigation water and the water table, if present. Under such conditions, seed germination, seedling development and yield may be seriously reduced. A pre-plant leaching irrigation is often used to remove these surface salt concentrations. If winter rainfall is insufficient to leach the accumulated salts from the topsoil, applying an irrigation before the onset of limited winter rains refills the upper soil with water and the winter rains may then be relied upon to provide sufficient water for leaching. Rainfall is excellent in quality and leaches salts out of the seed areas, thus eliminating germination problems. Late autumn or early winter irrigation is a good practice in a Mediterranean climate where winter rains may not provide all the necessary leaching. Winter plus pre-plant irrigations give the user of less than ideal quality water greater flexibility in timing of irrigations during the growing season. When using water of moderate to high salinity (ECw > 1.0 dS/m) germination is often poor due to salts accumulating in the seed row, especially when crops are seeded on raised beds and furrow irrigated. A common practice among growers of lettuce, tomatoes and other sensitive annual crops is to use sprinklers to reduce salinity to obtain better germination, to lower surface soil temperatures and improve early seedling growth. Irrigations are applied one or more times each day for several days and for relatively short periods of time - 1 to 3 hours' duration. After 10 to 14 days the sprinklers are moved to another field and normal furrow or flood irrigations are applied as needed. One sprinkler system can be used for germination and early growth of several different fields in a season. Overhead sprinklers cause problems for certain sensitive crops when chloride or sodium is relatively high. These concentrate as water evaporates between sprinkler rotations and are then absorbed in excessive amounts by the leaves wet by the sprinklers. These problems occur mostly with slowly rotating sprinkler heads and are aggravated by low rates of application. Sodium or chloride in the water in excess of about 3 me/l causes the problem. Similar problems can occur due to drift of spray from sprinklers applying moderately high salinity water. The toxicity usually appears as leaf burn (necrosis) on the leaf-edges and can be confirmed by leaf analysis for chloride and sodium. Irrigating during periods of higher humidity, as at night, has often greatly reduced or eliminated the problem. Annual crops, for the most part, are not very sensitive to low levels of sodium and chloride but all crops will be affected if the concentration is high enough. These problems are discussed in more detail in Section 4.3. Salinity reduces or slows germination and it is often difficult to obtain a satisfactory stand of furrow irrigated crops on saline soils or when using moderately saline water. In some cases, growers plant two or three times as much seed as normal, hoping to offset the reduced germination. Increasing the amount of seed planted can give higher plant density (Table 8) but may also result in additional thinning costs; even then the plant population may not be uniform and increased yields cannot be assumed. A better alternative might be to make appropriate adjustments in planting procedures to ensure that the soil around the germinating seeds is sufficiently low in salinity. Suitable planting practices, bed shapes, and irrigation management can greatly enhance salt control during the critical germination period. 1 Data taken from Pasternak (1975). 2 Acceptable field practice in Israel. With furrow irrigated crops planted on raised beds, water movement is from the furrow into the bed. Since water moves from the two furrows towards the centre of the bed, any salts present move with the water and tend to accumulate in the upper centre of the bed. Planting seeds in a single row in the centre of a raised bed places the seed exactly in the area where salts concentrate (Figure 12A), planting a double-row on a raised planting bed (Figure 12D) will place the two seed rows near each shoulder of the raised bed, away from the area of greatest salt accumulation. By this planting method, soil and water salts still concentrate near the centre of the bed but away from the seed rows and germination is likely to be better if salinity is a problem. There are other planting alternatives. Alternate row irrigation may help. If the beds are wetted from both sides, the salts accumulate near the top or centre of the bed (Figures 12A and 12D) but if alternate rows are irrigated, the salt can be moved beyond the single seed row (Figure 12B). The salts may still accumulate, but to a lower concentration. Off-centre, single-row planting on the shoulder of the bed closest to the watered furrow (Figure 12E) has also been used and aids germination under salty soil conditions. Double-row planting with alternate row irrigation is not recommended as salts would accumulate in the second seed row from the wet furrow. With either single or double-row planting, if salts are a problem, increasing the depth of water in the furrow can also be an aid to improved germination (Figures 12C and 12F). Still better salinity control can be achieved by using sloping beds with seeds planted on the sloping side and the seed row placed just above the water line (Figure 13). Irrigation is continued until the wetting front has moved well past the seed row. A correct configuration for a single-row sloping bed that is easy to cultivate and convert back to a conventional raised bed is shown in Figure 14. This reshaping is usually done after germination and after the early growth period. Another widely used modification of the single-row sloping bed is shown in Figure 15; it is used for both salinity and temperature control. The seeds are planted just above the water line in the furrow. For a crop planted in winter or early spring, a soil temperature a few degrees warmer is important; the sloping bed is oriented toward the south in the northern hemisphere. In hot climates, where cooler soil temperature is desired, reversing this slope (facing away from the sun) has been beneficial. The pattern of salt build-up depends on bed shape and irrigation method. Seeds sprout only when they are placed so as to avoid excessive salt build-up around them. For different soil salinities, the diagrams in Figure 16 show the effectiveness of modifying the shape of the planting beds. Actual response will depend on the initial soil salinity, the irrigation method, the irrigation water salinity, and the crop tolerance during germination. Since salinity slows germination of many crops, holding the water in the furrows for a longer period sometimes improves emergence by maintaining moist soils, reducing crusting, and it actually dilutes or reduces salinity. The larger seeded crops, such as maize, are sometimes planted in the water furrow for improved germination under salty conditions. Grapes, too, are sometimes grown in the bottom of wide, flat furrows or at the bottom of wide, gently sloping V-shaped furrows. Much of the root zone then remains relatively low in salinity. Fertilizers, manures, and soil amendments include many soluble salts in high concentrations. If placed too close to the germinating seedling or to the growing plant, the fertilizer may cause or aggravate a salinity or toxicity problem. For example, an application of 50 kg per hectare of nitrogen (240 kg/ha of ammonium sulphate) would cause no salinity problem if spread uniformly over a one hectare area. However, if drilled with the seed at planting time, it would probably reduce germination or growth of seedlings and might result in crop failure caused by the high salinity of the fertilizer placed too close to the seed. Care, therefore, should be taken in placement as well as timing of fertilization. Seedlings are sensitive to salts and, while small, require little fertilization. A small amount of fertilizer can be applied at or before planting, and the remainder in one or more applications after crop emergence but before the main growth period. In addition, a fertilizer with a lower salt index can be considered. The lower the salt index of the fertilizer, the less danger there is of salt burn and damage to seedlings or young plants. Salt indices for various fertilizers are shown in Table 9. Salt tolerance of a crop is generally considered to be unaffected by raising the level of soil fertility above that necessary to supply needed nutrients for optimum growth. However, if both salinity and low fertility are limiting yield, correction of either or both will improve yield. If, however, the fertility is adequate and the salinity is limiting, further increasing the fertility will not increase yield or improve the salt tolerance of the crop (Bernstein, Francois and Clark 1974). The method of irrigation directly affects both the efficiency of water use and the way salts accumulate. Flood and sprinkler irrigation are designed to apply water evenly over the entire irrigated area. This results in most of the salts accumulating in the lower root zone. The degree of accumulation depends upon the leaching fraction. Figure 2 illustrates several typical salinity profiles resulting from surface flooding or sprinkler irrigation at leaching fractions varying from 0.1 to 0.4. 1 Data taken from Rader (1943). 2 The salt index is for various fertilizer materials when applied at equal weights. Sodium nitrate, with a salt index of 100, is used as a base for the index. Figure 17 shows the salt accumulation patterns for surface flooding or sprinkler irrigation which apply a uniform depth of water across the entire field as contrasted to the salt accumulation patterns from furrow or localized (drip, trickle or spitter) irrigation which apply water to only part of the field surface. In the case of furrow irrigation, salt builds up with depth in the soil similar to flood irrigation, but salt also accumulates in the areas not covered by water. Salt moves with the water to the high points where the water evaporates most rapidly and is leached to greater depths as water drains by gravity. For localized irrigation, salts accumulate at the edges of the soil wetted from the emitter. This results in a wetted spherical shape with salinity highest at the outer edges of the sphere. Isolated pockets of accumulated salt frequently result where water does not infiltrate sufficiently to accomplish leaching. These can be raised areas, areas of more dense soil, or areas not getting enough water during irrigation. Typically these show as bare spots or areas of reduced or stunted growth. A well designed sprinkler system generally provides the greatest uniformity of application, but this is often a problem no matter which system is used. Each irrigation method has certain advantages and disadvantages and all known factors should be considered before attempting to improve salinity control by changing the method. With surface flooding methods (flood, basin and furrow), depth of applied water entering the soil varies with location in the field and depends on the infiltration rate and time available for infiltration. Differences in the rate of infiltration are caused by land slope, degree of compaction, textural changes, and soil chemistry. The opportunity time during which infiltration can take place also varies; the upper end of the field nearest the water source usually has water on its surface for a much longer time than does the lower end. The driest area is typically about two-thirds of the distance down the field. High spots in the field also receive less water because, being high, they are covered by less water and for a shorter period. These surface flooding methods are usually not sufficiently flexible to apply less than an 80 to 100 mm depth per irrigation. As a result, irrigating more frequently to reduce possible water stress may also waste water and cause waterlogging and drainage problems. In order to relieve water stress, it may be easier to increase the frequency of irrigation with sprinklers or drip irrigation rather than with surface flooding. However, sprinkler and localized irrigation have their problems too and are not adapted to all conditions of water, soil, climate, or type of crop. A well-designed sprinkler system will apply water with good uniformity and at rates of application low enough to prevent runoff. If well managed, it will result in an excellent overall irrigation and adequate and uniform leaching. Depth of water applied is controlled by adjustments in the duration of application, sprinkler spacing and nozzle size. Wind can distort the water patterns and must be considered. Sprinklers are sometimes used to aid in temperature control, germination and early seedling growth at which time the crop may be particularly sensitive to salinity, high temperatures and soil crusting. On sensitive crops, however, sprinklers can cause leaf burn if the salts (sodium or chloride) concentrate excessively on the leaves as water evaporates between rotations of the sprinkler. These salts are absorbed and may cause a toxicity. These problems are discussed in detail in Section 4.3. One of the concerns expressed about sprinkler use in hot arid areas is the evaporation loss during sprinkling and the possible increase in salinity of the water that infiltrates the soil, but there is no clear evidence that this evaporation is significant enough to warrant concern. One field study in the Imperial Valley of California, USA, using a solid set sprinkler system, showed that evaporation losses on a hot, dry day (temperature 47° C, relative humidity 27 percent and wind speed 3.7 km/h) caused a 20 percent increase in water salinity (ECw) near the field edge but less than 5 percent within the main portion of the field (Robinson 1973). Other trials have shown similar evaporation losses. A concentration factor of less than 5 percent is expected to have little effect, but the 20 percent factor could cause some difficulty for salt sensitive plants at the edge of the field. Localized irrigation systems (drip, trickle or spitter) apply water on a daily or near daily basis at a very low application rate (2–8 litres per hour per emitter). The near daily replenishment of the water used by the crop keeps the soil moist and very near to or slightly above field water holding capacity. The irrigations should maintain a slight but nearly continuous downward movement of moisture and salts for excellent short-term salinity control. Irrigation efficiency can be close to 100 percent during the cropping period, meaning that the crop evapotranspiration demand can be met essentially without losses due to runoff or deep penetration. Salts also accumulate with localized irrigation. However, they accumulate at the soil surface between emitters and at the outside edges of the area wetted by the water applicators (Figure 17). With time, this salt accumulation at the soil surface and in the wetted fringe between emitters can become appreciable, and is a hazard if the salt is then moved by rain into the root zone of the crop or, in the case of annual crops, if a new planting is made in these salty areas without prior leaching. On the other hand, if rainfall is sufficient each season to leach the accumulated salts, no problems should be anticipated. The most dangerous period is thought to be just after the first rainfall when the surface salt has been moved down into the root zone but sufficient rainfall has not yet fallen to move the salt below the root zone. It is recommended that regular irrigations continue during a rain or until 50–100 mm has fallen. If rainfall is insufficient, supplemental leaching with the localized system may be needed. Leaching by sprinklers or surface flooding after a season of localized irrigation and before replanting has been effective in removing accumulated salts. However, this may require a second irrigation system and will require large quantities of additional water, but it may be necessary for continued good production when utilizing relatively salty water and localized irrigation. With good quality water, yields with localized (drip) irrigation should be equal to, or slightly better than other methods under comparable conditions. With higher salinity water (ECw > 1.0 ds/m), yields are often better, due to the continuous high moisture content maintained by daily replenishment of the water used by the crop. Frequent sprinkler irrigation might give similar results, but tests indicate the probability of excessive leaf burn and defoliation from leaf absorption of sodium and chloride, and reduction in yield. If accumulating salinity exceeds crop tolerance with the usual method of irrigation, a better yield may be possible with localized irrigation. Sub-irrigation, adapted to only a few situations is accomplished by rapidly raising the water table into the root zone, and after a few hours to a day or two, draining it to prevent aeration problems. Lapsed time for the rise and fall of the water table is 2–5 days. The upward movement of the water tends to concentrate salts on or near the surface irrespective of whether the salinity originates from the water table or the soil. Salt accumulation must be controlled by adequate rainfall or pre-plant leaching. Sub-irrigation cannot be used with poor quality groundwater unless the soil is leached periodically by natural rainfall, or surface applied leaching water. Figure 18 shows salt distribution patterns resulting from various methods of irrigation of bell peppers. It also shows that each method resulted in a significantly different yield although the same amount of water was applied. With localized (drip) irrigation, a crop irrigated with what is normally considered good quality water (ECw = 0.6 dS/m) yielded about 50 percent more than the sprinkler and furrow irrigated plants. The advantage of the localized system was more pronounced with the higher salinity irrigation water (ECw = 3.8 dS/m). Part of the difference in yield can probably be explained by the close placement of the emitters to the plants and more frequent irrigations with the localized irrigation method. This provided good salinity control in contrast to crop damage by absorption of sodium or chloride through leaves wetted by the overhead sprinklers. The foregoing discussion of salinity control alternatives emphasizes practices that are required each year or for each crop and are repeated frequently as opposed to those that may be performed once during early stages of land development, or as an aid to reclamation of deteriorated land. These latter techniques are seldom repeated and are often costly and require special engineering to complete. Their goal is to improve existing soil conditions permanently in order to make irrigation, salinity control and cropping easier. Typical practices performed during development stages are levelling land to a given slope, establishing adequate drainage (covered or open drains), deep ploughing or slip ploughing to alter the soil profile physically, and leaching to reduce excessive salinity. Salinity control is difficult if land is not sufficiently level to allow satisfactory water distribution and uniform infiltration. Land grading changes the natural slope of the field to a uniform grade. A certain amount of soil compaction is caused and it is advisable to follow the land grading procedure with subsoiling, chiselling or ploughing to break up the compaction caused by the heavy land grading equipment and improve uniformity of water penetration and leaching. Land planing simply smooths the surface and, although a good practice, cannot be considered equal to, or a substitute for land grading. Land grading and land smoothing are also discussed in Section 2.4.4.i. Subsurface drainage problems and shallow water tables greatly complicate salinity control. Shallow water tables frequently occur due to the presence of a slowly permeable layer below the soil surface such as a clay barrier, hardpan or bedrock. Drainage problems are most frequently caused by over-irrigation but may also be caused by seepage from upslope areas or leakage from canals. The most effective control of salinity associated with a shallow water table is first to lower and stabilize the water table. A discussion of drainage needs is presented in Section 2.4.1 as one of the primary options considered for controlling salinity caused by poor quality water. 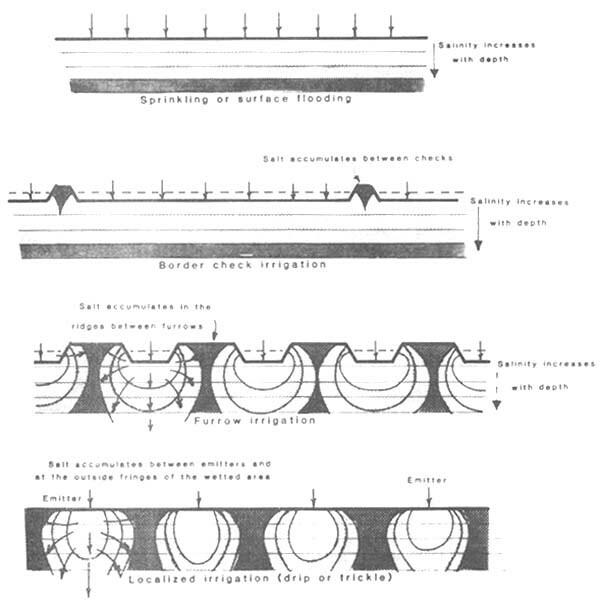 An in-depth discussion of drainage needs, surveys and designs is given in Dieleman and Trafford (1976) and Dieleman et al. (1980). If new land is being brought into production, drainage must be considered, and it is essential for the long-term success of any irrigation project or irrigated area. If drainage problems are in any way to be anticipated, plans for their immediate or future control must be formulated. With adequate drainage established, surface soil salinity can be controlled by irrigation management. Stratified or layered soils are difficult to irrigate efficiently. Layers of clay, sand or hardpan frequently impede or prevent deep percolation of water which is essential for salinity control. Irrigations to supply crop water demand plus salinity control can be greatly simplified if these layers are broken, destroyed or at least made more permeable to water. Subsoiling and chiselling are considered to be temporary improvements only and are often short-lived (1–5 years), whereas deep and slip ploughing can permanently improve internal drainage. These are usually done after land grading and drainage but before any needed reclamation. Deep or slip ploughing is costly and usually necessitates growing an annual crop such as barley following the ploughing, to allow the disturbed soil to settle. Following one or two barley crops, a touch-up land grading to re-establish the proper grading is also usually necessary. In many cases, wind or water-deposited sands are sufficiently stratified and dense so that deep ploughing or deep chiselling will greatly improve crop response and yield. If salinity is excessive and greatly exceeds the tolerance of the planned crops, a major leaching to lower salinity (reclamation) may be necessary before cropping is possible. The salts may have accumulated due to events in the past history of the soil, to the presence of a shallow water table, or they may have accumulated from inadequate leaching of salts brought in with the irrigation water. In any case, their concentration in the upper root zone (0.3 m) must be reduced to near the tolerance of the crop before any cropping is attempted. In soils with upper root zone salinity less than about an ECe of 10–12 dS/m, an application of 10–20 cm of water as a pre-plant irrigation (sprinklers or flood) coupled with a light irrigation following planting is usually sufficient to start a tolerant crop such as barley or cotton. If the root zone salinity of the upper root zone is much greater than ECe of 10–12 dS/m, the pre-plant irrigation may not be sufficient and a reclamation leaching is advisable before planting even a tolerant crop such as barley. The depth of water that must be applied to assure adequate reclamation depends on the initial soil salinity and the leaching method used. The higher the salinity, the greater the depth of water needed. Intermittent leaching will reduce the soil salinity more efficiently (use less water) than will continuous leaching (ponding), but the time required to accomplish the leaching will be greater. The influencing factor is the soil-water content during the reclamation leaching. Efficiency is increased if the percolating water moves more slowly (unsaturated flow) and is occasionally allowed to drain to field capacity as is done in intermittent leaching. Under continuous ponding a higher proportion of the leaching water moves through the larger soil pores and bypasses smaller pores. Salts trapped within these smaller pores, therefore, are removed at a slower rate per unit of water applied. Sprinklers apply water at a relatively slow rate and are very efficient in leaching. It is not possible to predict with accuracy the depth of water that must be applied to accomplish the reclamation leaching, but as a guide for continuous ponding, 70–80 percent of the soluble salts initially present will be removed with a depth of applied water equal to the depth of soil to be reclaimed. For example, a 1 metre depth of percolated water can be expected to leach 70–80 percent of the salts from a 1 metre depth of soil. Figure 19 shows that the percentage removal is highly dependent on soil type but, as a general guide, the 70–80 percent removal should be reasonably representative for most irrigated soils. For sprinklers or intermittent ponding, about 80–90 percent of the salts initially present in the soil will be removed with a depth of applied water equal to the depth of soil to be reclaimed, but more time is required to accomplish the leaching. Figure 20 shows that with intermittent ponding, soil type does not play as important a role as with continuous ponding. Localized irrigation has been used successfully for reclamation by placing one line of closely spaced emitters on the flattened top of a raised planting bed such as used in furrow irrigation. The irrigation is continued until the desired leaching has been accomplished. After planting, the crop is irrigated by localized irrigation. The resulting reclaimed zone in the soil may be spherical with the emitter at the top of the sphere (Figure 17). The salts are leached to the outermost fringe of the wetted area and into the unwetted areas between the emitters, and by evaporation an appreciable salinity develops at the soil surface. This surface salinity sometimes gives trouble if a light rain moves the accumulated salt back into the root zone (see Section 2.4.5, localized irrigation). If salinity is not too severe, extra irrigation water applied during the growing of a salt-tolerant crop will accomplish reclamation. Barley and rice are common reclamation crops. The reclamation crop is planted as soon as possible after the topsoil salinity is reduced to within its tolerance. The crop is believed to aid reclamation due to a combination of effects including the physical action of roots to keep the soil more open to allow additional water to infiltrate, the addition of organic matter or the alternate drying and wetting of the soil which promotes better soil structure. Attempts to remove salts from the soil surface by runoff and overland flow are relatively ineffective. Surface flushing will remove a part of the salts but quantities removed are usually entirely inadequate to accomplish appreciable reclamation. where the concentration can be expressed as either ECw or me/l but the same units of concentration must be used throughout the equation. Blending water supplies for salinity control is not a common practice. Most users alternate between the two supplies. Alternating use can be beneficial, particularly in locations where winter rains or winter irrigations are used to meet most or all of the leaching requirement. Since the total salt load applied will remain the same, it may be advisable to use the better quality supply in the early part of the cropping season and the poorer quality blend later when the crop is less sensitive to salinity. An example of blending is given in Example 5 and Table 10. A farmer is irrigating a maize crop with canal water (ECw = 0.23 dS/m) and is able to achieve a leaching fraction (LF) of 0.15 by using efficient irrigation practices. The irrigated area could be expanded but no additional canal water is available. A well is available but the water quality is marginal for maize production (ECw = 3.6 dS/m). Could these two water sources be safely blended and thus expand the irrigated area? The use of well water alone would result in a 40 percent increase in water use per hectare to achieve the same maize production as could be obtained using the canal water. The above shows that the area presently irrigated with canal water at Aw = 941 mm/ha/year could be expanded with no increase in Aw/ha/year if the canal water were blended with up to 44% well water. Yield potential would be maintained at about 90% and the planted area could be expanded by 44%.